How To Get 5X Ultimate Rewards Points or 5% Cash Back on ALL Amazon Purchases! Emily and I buy a lot of items from Amazon.com. I started using Amazon.com to buy textbooks over a decade ago, but we now buy almost everything on Amazon.com. It is great to not have to waste time driving to a store, parking, standing in line when we can get the same items delivered to our door! Buying an Amazon.com Gift Card with the Chase Ink Bold at Office Max for 5 Ultimate Rewards Points or 5% Cash Back per $1! Amazon.com usually has the best price on most of what we buy online and sometimes it is worth the small premium if Amazon.com has a higher price to save time. Amazon sells millions of items from books, electronics, DVDs, food, shoes etc. But what if you want to earn points or cash back on Amazon.com purchases? How to Earn 5X Ultimate Rewards Points or 5% Off ALL Amazon Purchases! Amazon.com doesn’t participate in most online shopping portals, and while it does participate in Ebates, the 3% cash back is limited to only certain departments. But it is very easy to use your Chase Ink Bold or Chase Ink Plus buy Amazon.com or Kindle gift cards, with NO purchase fees, at either Office Depot, Staples, or Office Max. If you return an item paid with a gift card, you automatically get a credit to your Amazon.com gift card balance. The Chase Ink Bold or the Chase Ink Plus earns 5 Ultimate Rewards points per $1 spent at Office Supply stores, which INCLUDES Amazon or Kindle gift cards. 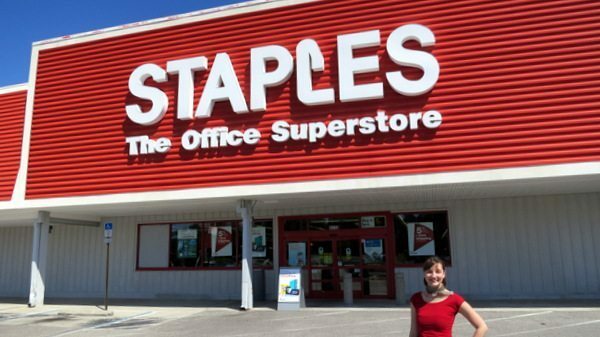 5X Points at Office Supply Stores! It is very easy to load these gift cards to your Amazon.com account and earn either 5 Ultimate Rewards points or 5% cash back per $1 spent for ALL your Amazon.com purchases. You don’t need to be incorporated to apply for a business credit card and can also apply for a business credit card as a start-up business with little to no revenue. But don’t lie on the application form! You can buy Amazon.com OR Kindle gift cards at Office Depot, Staples and Office Max, with NO fees, and easily apply them to your Amazon.com account. Many folks think that Kindle gift cards can only be used to buy e-books, but you can use them for millions of items on Amazon.com. 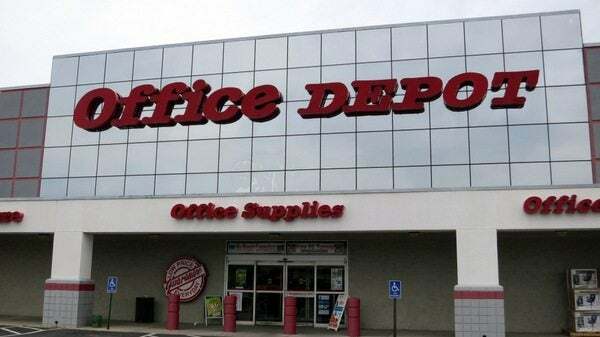 Office depot sells Amazon Kindle cards and Kindle Fire cards…. …which with look like this. 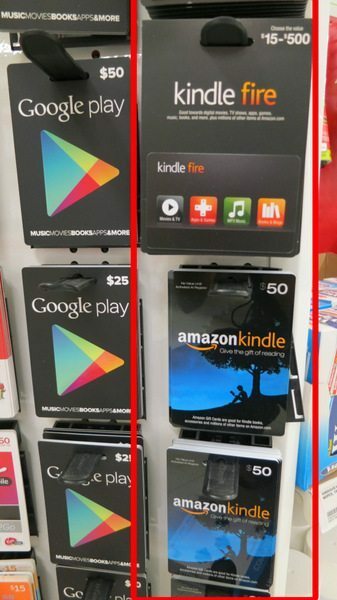 You can buy up to a $500 Kindle Fire card which makes it easier to load than multiple cards of $25 or $50. 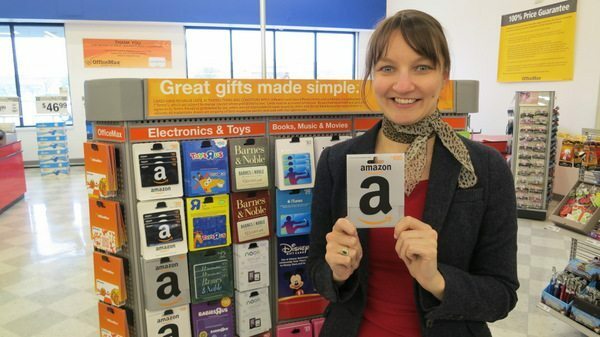 You can also buy Amazon.com gift cards at Staples. Emily Getting Ready for 5X Ultimate Rewards Points! How to Load Amazon or Kindle Gift Cards to YOUR Amazon.com Account? 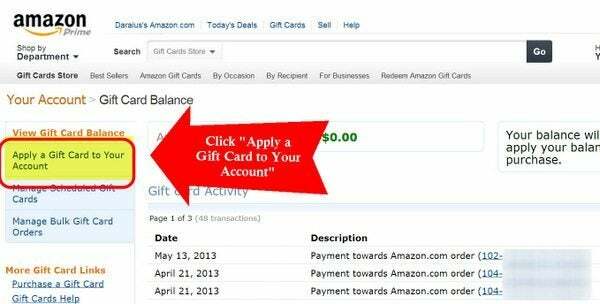 You can electronically add a gift card to your Amazon.com account online in just a few easy steps. 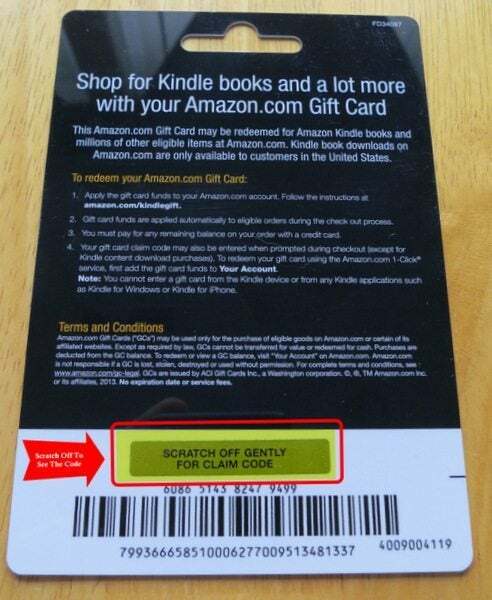 Scratch the code off the back of your Amazon.com or Kindle gift card. 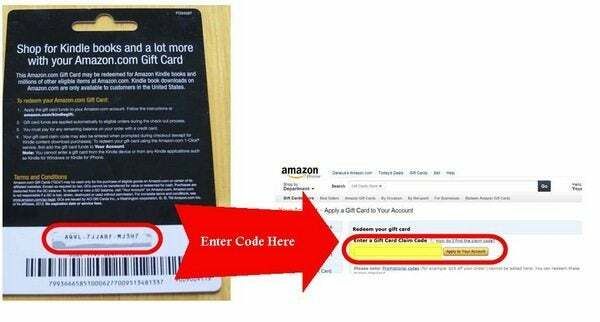 Sign-in to your Amazon.com account via this link to load a gift card into your account. Click on “Apply a Gift Card to Your Account” on the left side of the screen. You do not have to enter the spaces or dashes between the letters and numbers. You’re done! You will a see a message that your gift card has been applied to your account and will be used towards your next order! You can enter as many gift cards as you like and the balance will be updated in your Amazon.com account and used for future purchases. 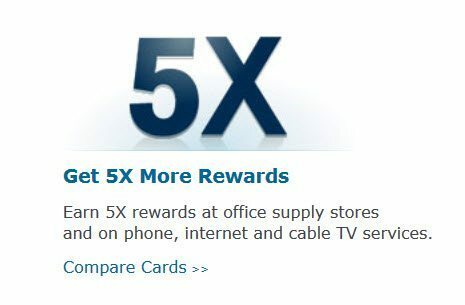 You get 5 points per $1 spent or 5% cash back at Office Supply stores (all the time) up to $50,000 in spending per cardmember year on the Chase Ink Bold or Chase Ink Plus. These cards have a $95 annual fee, but you can transfer points to Ultimate Rewards hotel and airline partners such as Hyatt, United, and Southwest. The Chase Ink Business Cash Credit Card and Chase Ink Classic have NO annual fee, but you get 5X Ultimate Rewards points or 5% cash back at office supply stores only for $25,000 in annual spending per year at Office Supply stores. You can’t transfer points from the Ink Cash or Classic directly to airline or hote partners. But you can transfer the Ultimate Rewards points to the Chase Sapphire Preferred, Chase Ink Bold or the Chase Ink Plus card and from there to airline or hotel partners such as Hyatt or United. Earning 5 Ultimate Rewards points per $1 or 5% cash back for all Amazon.com purchases is easy with the Chase Ink cards. However, you may want to use a credit card if you buy expensive electronics etc. from Amazon.com because it could be easier to dispute the transaction if you pay with a credit card instead of an Amazon gift card if you need to later on. That said, Amazon.com does have very good customer service and often sides with the buyer instead of the seller. to power the message house a bit, but other than that, this is fantastic blog. Can you manage to get %5 on either all ebay or all paypal purchases? @luchex – I can’t remember if Office Supply stores sell ebay gift cards, but you could buy regular gift cards and use those for ebay purchases, though it could be a pain to keep track. I’ve been browsing online more than 4 hours today, yet I never found any interesting article like yours. It’s pretty worth enough for me. 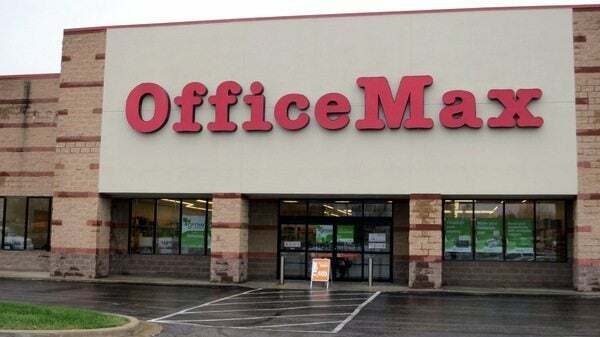 Can you get the 5x buying Amazon gift cards from Office Max online with Ink Plus? @Larry – I wasn’t able to buy Amazon gift cards online. -Notify me when new comments are added- checkbox and from now on every time a comment is added I get 4 emails with the same comment. @www.dangerzonebeatz.com – There should be an unsubscribe option in the email which you get.